When Gawker moves its offices from SoHo to a-few-blocks-north-of-Houston I think about 100% of the Jalopnik staff will make the move. That's better than what Toyota is estimating when it moves to suburban Dallas from SoCal. This story from Automotive News makes the case that Toyota is actually doing a decent job of trying to woo its workers with generous offers but that, uh, not everyone wants to move to Dallas. Toyota said that it has budgeted to retain 50 percent of its work force — a rough estimate of the number needed to stanch losses in productivity during the transition — but internally, said one person familiar with the matter, management fears that number will be closer to 30 percent. "They would be happy to have 50 percent," said that person, who asked not to be identified. "It's hard to tell [how many people will go] because nobody has been offered their jobs yet." 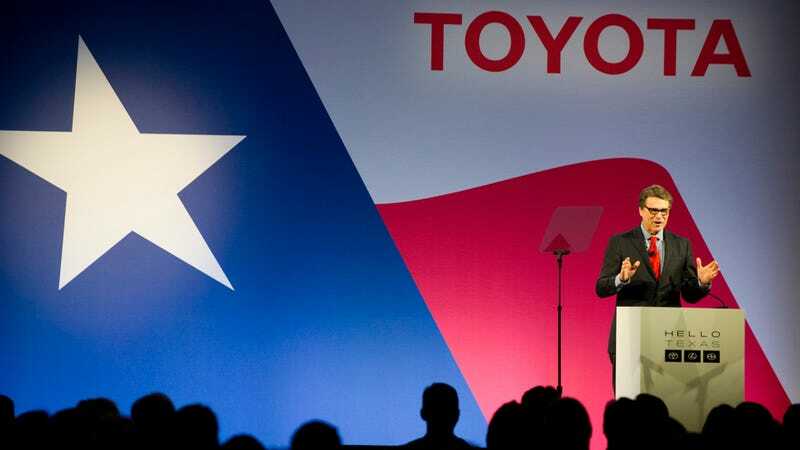 Ahead of the Texas move, Toyota has embarked on a robust campaign to persuade workers to stay with the company, hosting three-day, all-expenses-paid reconnaissance trips to Plano and putting employees up at one of the area's best hotels, The Westin Stonebriar. Toyota's internal website features articles such as "99 Things About North Texas" — hailing attributes from fried pickles to pristine roads — as well as a series of profiles on Toyota employees who already have decided whether to make the move. Please please please please someone send me that "99 Things" document. "We haven't yet asked our team members and associates to commit to their future with us – we want to give them plenty of time to assess their options, visit Texas and plan with their families as they make this very important decision. But the feedback we've gotten so far from their visits has been very positive, and we are hopeful that many of our employees will choose to make the move with us here." A rough week for Abenomics as a recent sales tax increase has led to two quarters of economic contraction, with GDP falling 1.6% in the third quarter. There was supposed to be another tax increase next year but, uh, that might not happen. What's going on here? Smarter people will be explaining it all day, but Prime Minister Shinzo Abe's idea to boost economic output while also paying down the country's giant debt with more sales tax hasn't quite worked out yet. Exports were up 1.3%, but so were imports, which sort of undermines the whole exercise. What does this mean for carmakers? Don't expect the yen to come rallying back, so automakers who export a ton of cars will continue to rake in nice profits. Japanese automakers will, however, probably continue to struggle in their home market as buyers seem uncertain. While a couple of quarters isn't enough to declare that Abenomics is a winner or a loser, it's clear that an obsession with debt doesn't lead to a stronger economy. How important is the new F-150 to Ford? So important that Barron's thinks it could help push Ford stuck up 30%, along with a market that expand next year. Ford (ticker: F) has been marked down 11% over the past year, to about $15, versus a 14% gain for the Standard & Poor’s 500 index. One reason is that, after years of steady financial progress, Ford’s earnings will drop this year on a mix of high warranty costs, poor results in Russia and South America, and lost production during the F-150 transition. Another is that the North American car and truck trade has bounced back to such robust levels that investors fear another downturn is looming. That looks unlikely. Ford’s ugly 2014 should give way to years of better growth. The shares look likely to climb 30% in a year. It's the bull case, of course, but I think it's a bull that doesn't leave the chute until he thinks he can knock that jackass off his back. A judge has ruled that CEO Sergio Marchionne will have to give a video deposition in a case related to the massive Jeep recall that now seems small relative to all the other recalls we've seen lately. Basically, in a rear-end collision the design of the old Jeep Grand Cherokee and Liberty meant the fuel tank was in a position to become punctured and catch on fire. The solution for the recall was a tow hitch. Jeb Butler, an Atlanta-based attorney representing the family in the lawsuit, alleges that Mr. Marchionne, as CEO of the company, has known about the design flaw in the Jeeps, but failed “to warn the American people about the danger of these fuel tanks.” Mr. Butler said the deposition will take place in a few months. The lawsuit is set for trial in March 2015. Jeep still denies there's a defect that makes these vehicles unsafe, so I'd like to hear an attorney ask Marchionne what the recall is supposed to do. Often the price of accepting a settlement is that you're often gagged from talking about what happened, thus depriving other people of information they may want to have. Confidential agreements are keeping valuable information out of the public eye, lawyers and safety advocates say. Many of the details that helped get to the root of a General Motors ignition-switch flaw came from statements made in depositions after the Detroit-based carmaker chose to fight a lawsuit rather than settle, said attorney Lance Cooper. His pursuit of a wrongful-death case involving a GM vehicle is credited by safety advocates with triggering recalls of 2.59 million vehicles this year. On this day in 1998, the brand-new DaimlerChrysler began trading its shares on the New York Stock Exchange. The company had formed five days earlier, when the American Chrysler Corporation merged with the German conglomerate Daimler-Benz AG. As a result of the merger, DaimlerChrysler became the world's fifth-largest automaker (behind General Motors, Ford, Toyota and Volkswagen). Neutral: Has your company ever moved? Did you move with them? Did they offer you a decent deal?